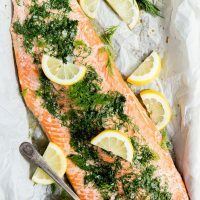 If you need to know the best way to bake salmon, this Easy Baked Salmon Recipe is quick, simple, flavorful and healthy. With a blend of butter or ghee, fresh dill and lemon this easy dinner recipe is sure to be a hit! 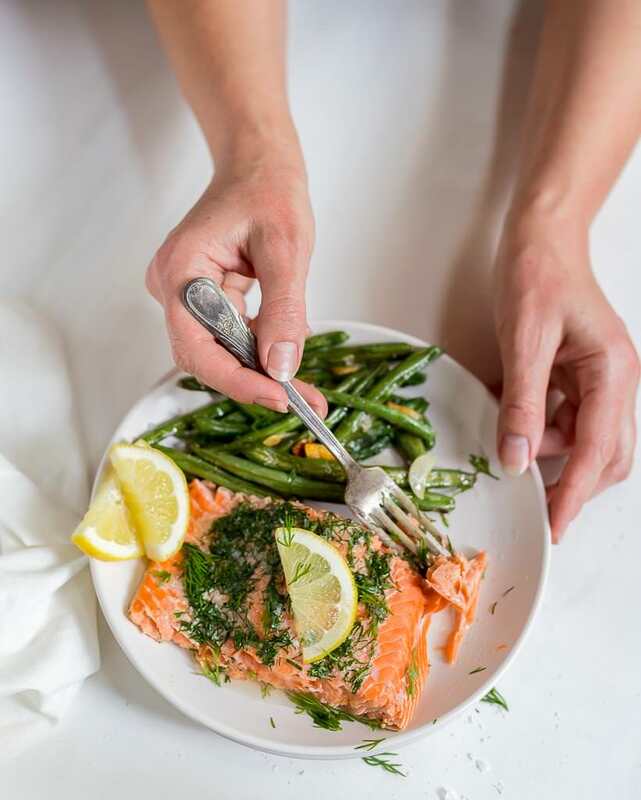 This salmon recipe is Whole 30, Keto, Low Carb, Gluten Free and great for meal planning. Easy. 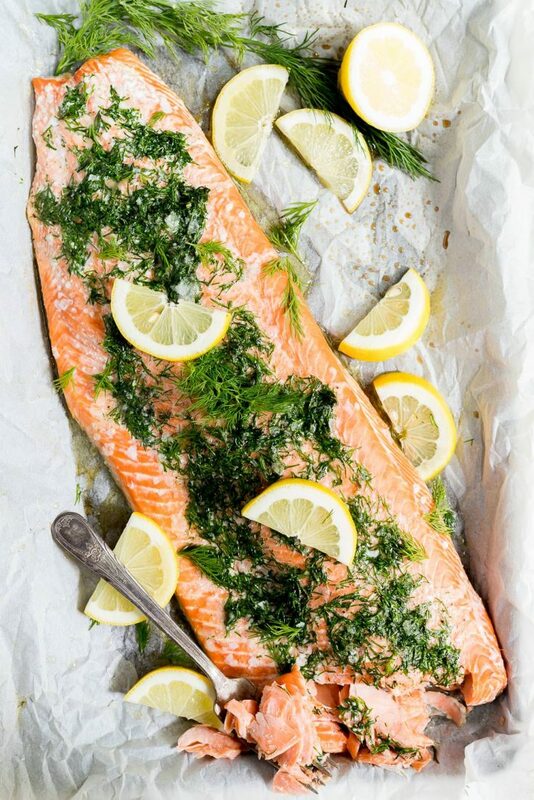 Oven Baked Salmon is the simplest, most straight forward way to cook salmon. Sure, salmon is great grilled, broiled, skillet fried and smoked. But if you just want to get a delicious salmon dinner on the table without a lot of fuss, oven baked is the way to go! If you are an experienced cook you probably already know how great salmon is for weeknight or weekend dinners. If you are less experienced, fish can seem intimidating. I know this because I spent a long time avoiding salmon and other fish because I thought there was no way I could cook it correctly. This Oven Baked Salmon method is great because it’s pretty forgiving. So just do it. I promise that after you give it a try you’ll be kicking yourself for not doing it sooner. I know I did. What type of salmon should you use? 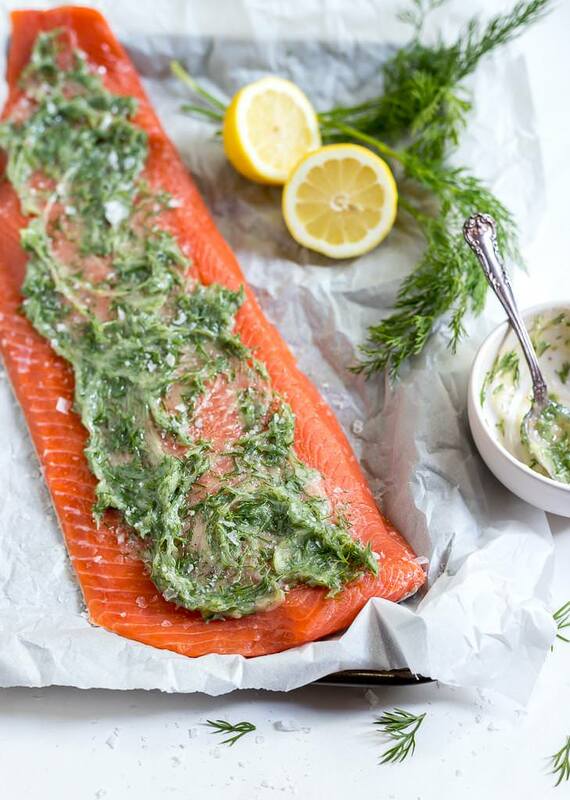 Use your preferred or available type such as Sockeye, Coho or Atlantic. Most importantly, use wild salmon. The farmed salmon tends to be mushy and less flavorful, in my opinion. How do you make this Whole 30 Salmon? Use ghee for a Whole 30 version and for Keto you can use butter or ghee. What temperature do you cook the salmon? I bake my salmon at 375ºF and I broil on high the last 2-3 minutes to give the top a little texture. How do you know when the salmon is done? Honestly, I’m just serving this to my family so I stick a fork in the thickest part of the middle to make sure it is pulling apart and flaky. After you make salmon a few times you can tell by looking and feeling it. You will need a Sharp Knife, Good Cutting Board and a Rimmed Baking Sheet . You will also need foil or parchment paper. 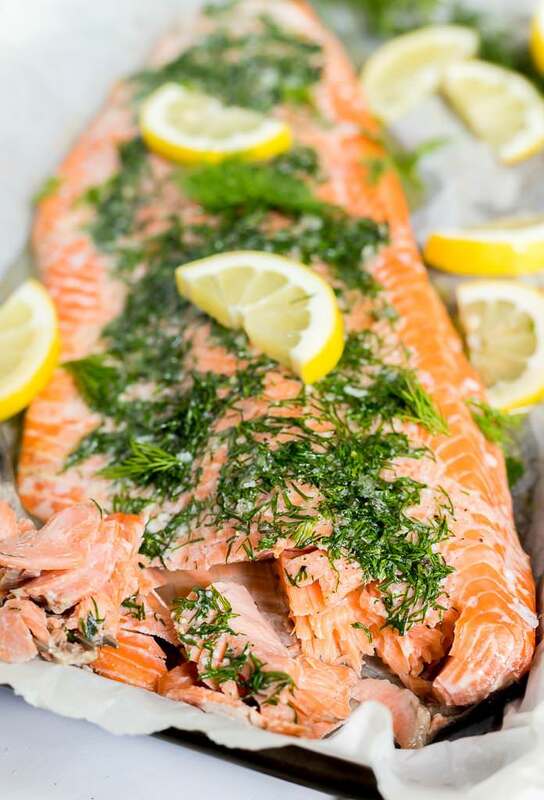 What should you serve with your salmon? I served this salmon with Roasted Fresh Green Beans with Garlic. But here are a few more ideas for side dishes: Oven Roasted Asparagus, Asian Cucumber Salad, Lemon Garlic Kale Salad or Balsamic Mandarin Salad. Line rimmed baking sheet with parchment paper (or foil) and spray with nonstick. Place salmon on prepped baking sheet and generously sprinkle with flaked sea salt. Mix ghee, oil, dill, salt and pepper. Spread mixture over the top of the salmon. Bake for 14 minutes then broil on high for 2-3 minutes to give the top a slight crust. Check the thickest part of the fish with a fork. Once the thickest portion is flaking, remove from oven and serve with lemon wedges. Really great recipe Nicole! I doubled the amount for a family dinner last night – and it all disappeared! Which is awesome, but I was hoping to have leftovers…Next time I will need to make even more 🙂 This is definitely a keeper, thanks!